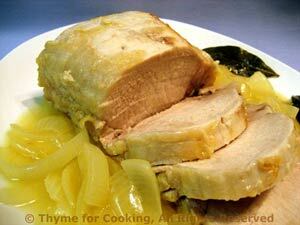 Thyme for Cooking Weekend Menu: Pork Loin, Onion Sauce, easy recipes. 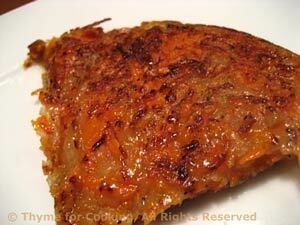 This is a variation on the Potato Leek Pancake that is one of my kitchen staples. Easy to make: just shred the vegetables, combine and fry. Shred the potatoes and carrots using the large holes on a grater. Put them in a bowl, add a bit of salt and pepper and combine well. Heat 1 tsp butter and 1 tsp oil in a medium nonstick skillet. Add the potato/carrot mixture, flatten as best you can with a spatula, cover and cook over medium heat about 15 minutes, or until starting to brown - take a peak around the edges. Put a plate (or tray) on top of the skillet. Grabbing the plate and skillet together (with hot pads) flip them over so that the pancake is on the plate. Add remaining butter and oil to skillet and slide the pancake back into the pan to cook the other side, another 7 - 10 minutes, but don't cover. When done, slide onto a plate, cut into wedges and serve.